Reverse the impact of pollution with this skin-refining serum. Defense Antioxidant Pore Purifier harnesses the pore-clearing power of salicylic acid to deliver powerful antioxidants deep into the skin, helping to undo daily pollution damage before it has a chance to impact your complexion. The exclusive Anti Pollution Factor blend contains niacinamide, vitamin C and a form of azelaic acid to smooth, brighten and repair skin, leaving it healthy, radiant and more even-toned. Shake gently before use. Apply a few drops to your face and neck twice a day after cleansing. Follow with a night cream in the evening, or with a day cream containing a broad-spectrum sunscreen rated SPF 30 or greater during the day. I love this! I have always had big pores and blackheads. Tried everything. This does what it says it does. Pores are so much clearer now. Even stubborn blocked pores are so much less noticeable. I’ll keep using this. If you have congested skin then you really need this serum. I've only been using this for a week and now I have the clearest skin I've ever had. (I'm mid fifties). It really is that good. Can't praise it enough. 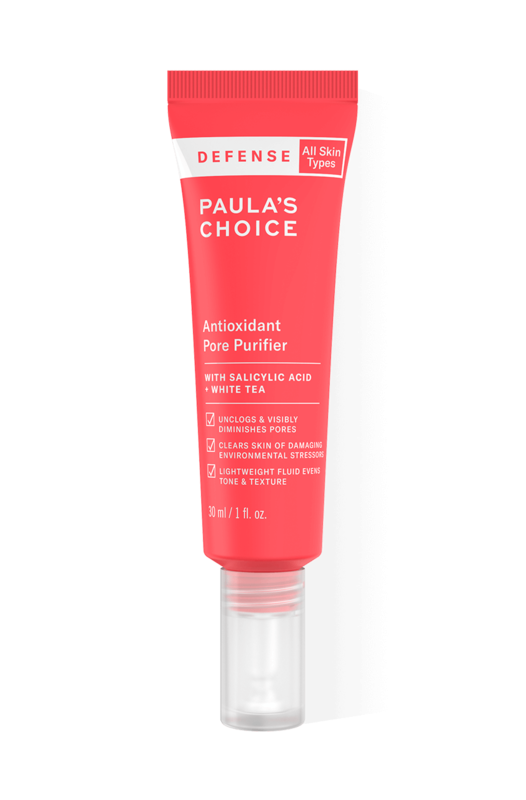 I have been using the Defense pore purifier for a few weeks now and I am loving it so far. The lightweight texture is lovely and absorbs really nicely leaving my skin feeling comfortably hydrated but not at all sticky. I am a big fan of the packaging - the nozzle makes it very easy to dispense just the right amount of product so no wastage! I've noticed a definite brightening in my complexion and I love that the antioxidants protect my skin against environmental damage! I have been using this all over for about 3 weeks and my skin definitely a lot brighter and the open pores on my cheeks are less visible. I have been using this all over for about 3 weeks and my skin is definitely a lot brighter and the open pores on my cheeks are less visible. Extracted from young buds of the tea plant, White Tea contains a high concentration of antioxidants. What makes this product different to other antioxidant serums by Paula's Choice? This product contains salicylic acid as well as antioxidants. Salicylic acid refines the pores and carries pollution-fighting antioxidants deep in to the skin to neutralise environmental pollution and blue light. Antioxidant Pore Purifier also contains ceramides and niacinamide to replenish and calm skin; plant extracts of white tea and ginseng to repair and protect skin from further damage; and an azelaic acid derivative to brighten the skin. All these ingredients work together to deliver healthier, clearer and brighter-looking skin.